Béarnaise [behr-NAYZ] is a derivative, or variation, of hollandaise. 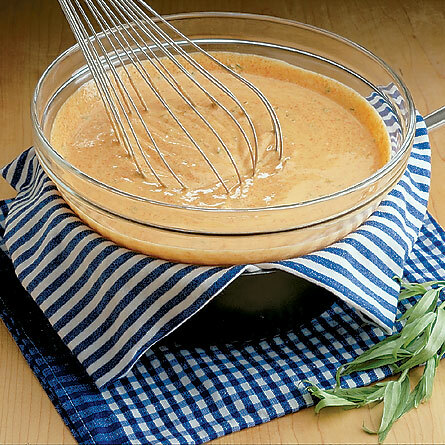 Prepare the sauce as directed in our How To Make Classic Hollandaise article, but follow this recipe for a delightfully buttery sauce enhanced with the light anise-like flavor of fresh tarragon. 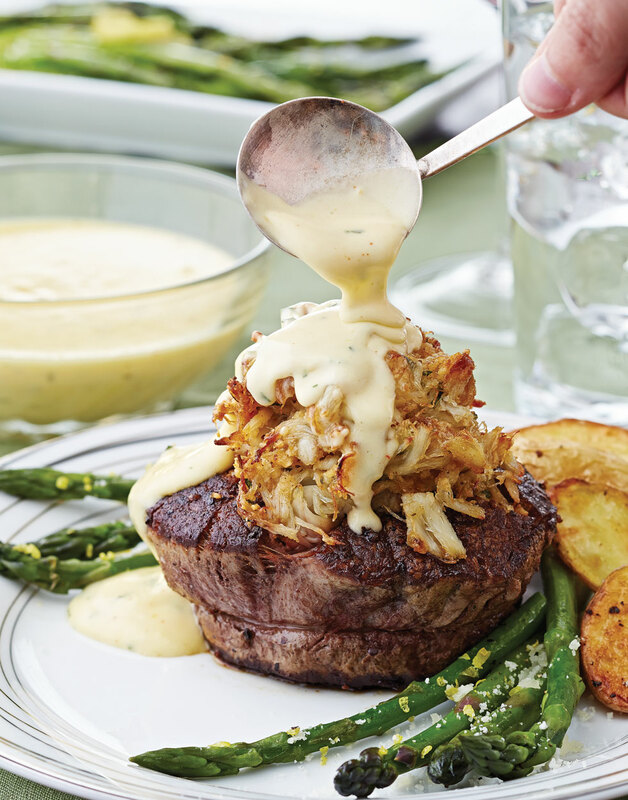 Use this béarnaise to top the Stuffed Filet Mignon Oscar or any steak of your choice. Choron [show RAWHN] is Béarnaise Sauce tinted with tomato paste. Perfect with beef! To make Choron Sauce, Add 3 Tbsp. tomato paste to the finished Béarnaise Sauce. Melt butter in a saucepan over low heat; skim off and discard foam. Reduce vinegar and wine with shallots and peppercorns in a saucepan over medium heat until it measures 3 Tbsp. strained liquid, 15–20 minutes. Simmer 1-inch water in a saucepan over medium-low heat. Whisk egg yolks and vinegar reduction in a stainless steel bowl. Place bowl over simmering water (don’t let bowl touch water). Whisk mixture vigorously until yolks begin to thicken and whisk begins to leave trails, 2 minutes. Remove bowl from heat. Off heat, whisk in lemon juice. Begin whisking butter into yolk mixture a drop at a time. As the mixture starts to thicken, whisk in remaining butter in a thin stream. If the mixture gets cold, return bowl to pan of simmering water and continue whisking in butter. Whisk in tarragon; season with salt and cayenne. If sauce seems too thick, thin with a little warm water. To keep sauce warm, transfer to a heatproof vessel; place in a pan of warm water set over low heat. Stir sauce often to keep smooth. To make Choron Sauce, Add 3 Tbsp. tomato paste to the finished Béarnaise Sauce. Clarified butter makes for a more stable sauce. To clarify butter, melt it, then skim off and discard the foamy solids that rise to the top. To gently cook the yolks, whisk them with the vinegar reduction in a double boiler until trails begin to appear and yolks thicken. To emulsify the butter with the vinegar without it separating, whisk it in a drop at a time to equalize the temperature between them. To hold the hollandaise before serving, keep it in a warm water bath, otherwise it might break (separate) or get too thick.